Antibiotics are not necessary — or even effective —for most cases. Each of us has a thin layer of tissue covering the whites of our eyes — the conjunctiva. 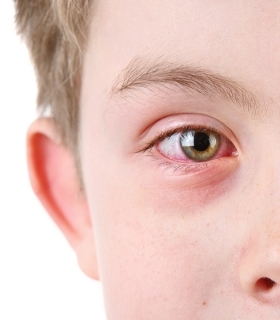 When this tissue becomes red and swollen, we call the condition conjunctivitis or pinkeye. While unattractive and sometimes uncomfortable, pinkeye is rarely serious. Practically speaking, pinkeye is similar to the common cold. Both conditions can be passed along to other children but both usually get better without medical intervention. What are the different kinds of pinkeye and how are they spread? Both eyes can be affected. Eyes can be red, itchy, or painful. There can be green or yellow discharge in the eyes that accumulates throughout the day. Eyes may be crusted shut after sleep. Incubation period: This is unknown because most of our eyes already contain the bacteria in non-infection causing levels. Contagious period ends: Twenty-four hours after treatment begins. Eyes can be pink, swollen, and watery. One or both eyes can be affected. Incubation period: Often accompanies the early stages of a viral respiratory illness that include other symptoms. Contagious period: Common types of viral conjunctivitis are contagious while symptoms are present. Adenovirus, a type of viral conjunctivitis that often accompanies fever, sore throat, or other respiratory symptoms, can be contagious for weeks after symptoms abate. Eyes can be red and watery. Only the exposed eye is affected. Reaction period: Symptoms appear just after exposure – such as after swimming in a chlorinated pool. Both eyes are usually affected. Eyes may water excessively and itch. Reaction period: Symptoms could present immediately or be delayed several hours after contact with the allergen. Some systemic diseases, such as Kawasaki disease, include pinkeye among their symptoms. Antibiotics would serve no benefit in treating viral, chemical, allergic, or immune-related pinkeye. According to the American Academy of Pediatrics, antibiotics shorten the infection period of even bacterial conjunctivitis only slightly. Help clear any discharge by gently cleansing eyes with warm water and a clean cotton ball every few hours. Remember to wash your hands before and after. Artificial tears can help ease irritation. Use one drop per eye, three times daily as needed, after cleansing the eye. Help redness with a long-lasting vasoconstrictor type of eyedrop sold over the counter. Children who wear contact lenses should switch to glasses while symptoms are present. How can I control the spread of pinkeye? Wash hands before touching the eyes, nose and mouth. Sanitize objects that come in contact with hands or faces such as door knobs, light switches, desks, and tables as well as children’s blankets, toys, and pillows. Is twelve weeks old or younger and has a fever. Do not give fever medication before calling. Has red eyes and a fever at any age. Has a red or swollen eyelid or eye pain. Is experiencing nonstop watering and blinking, blurred vision, or sensitivity to light. Has pus in the eye.